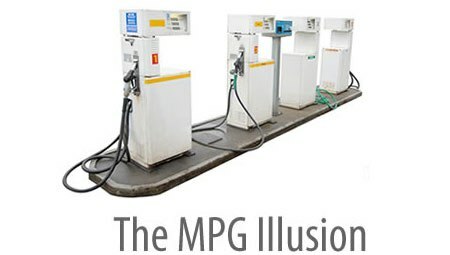 The MPG Illusion Website: Hypermiling, Hypoconsuming. First, let's translate hypermiling to a gas consumption metric. Let's call extreme performance in saving gas "hypoconsuming." Hypermiling and hypoconsuming are simply mathematical conversions of each other that depend on whether gallons of gas are put in the denominator (hypermiling) or numerator (hypoconsuming). Improving a car's MPG from 50 to 100 MPG saves 1 gallon over 100 miles. Improving a car's MPG from 100 to 150 MPG saves .3 gallons over 100 miles. Many SUV owners also try to hypermile. They are often criticized by others for the inconsistency (hypocrisy?) of trying to save gas in an inefficient vehicle. MPG invites the reaction, why bother trying to improve a 17 MPG to 24 MPG? If we focused on hypoconsuming instead of hypermiling, however, we'd see the benefits of getting SUVs from 17 to 24 MPG. The improvement saves over a gallon and half over 100 miles. Would it ever be possible to hold a hypoconsuming contest where the winner would be chosen based on gas saved from the baseline (EPA) MPG?